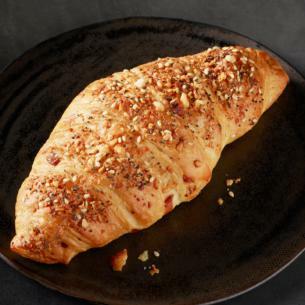 Our classic, buttery croissant gets a modern update with savory Asiago, Gruyere and Fontina cheeses. We balance that subtle saltiness with the sweetness of onions, and toss on some crunchy sesame and poppy seeds. enriched flour (wheat flour, niacin, iron, thiamine mononitrate, riboflavin, folic acid, enzymes, ascorbic acid), butter (cream [milk], salt), water, whole milk (milk, vitamin d3), fontina cheese (milk, salt, bacterial culture, calcium chloride, microbial enzyme), asiago cheese (pasteurised milk, salt, bacterial culture, calcium chloride, enzymes), sugar, gruyere cheese (pasteurized partly skimmed milk, bacterial culture, salt, microbial enzyme, calcium chloride), yeast, sesame seeds, salt, dehydrated onion, poppy seeds, eggs, wheat sourdough (water, fermented wheat flour), dough conditioner (enriched wheat flour [malted barley flour, niacin, reduced iron, thiamine mononitrate, riboflavin, folic acid], ascorbic acid, enzymes, sunflower oil), sea salt, skim milk powder, soy flour, cellulose powder.